The overall market is moving up higher and higher and I am very hopeful that all your stocks must be giving very good returns. I am sure that you would have experienced a beautiful run up of quality stocks which were dormant for a long period of time. Today's article is purely and purely out of experience. Before we begin let us understand Market Cap. For this, please read my article - Click here..
A large cap company is one whose Market Capitalization is more than 10000 Crore. 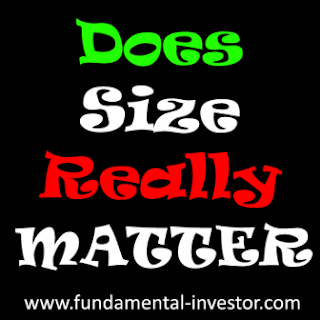 Most of the investor friends of mine are experts in picking mid and small cap stocks which are cheap. Whenever, I used to talk about a Large Cap, their interest was low, since the thought process was that it cannot move up much. How can a Large Cap create wealth for shareholders? Is it worth? Can we make money in Large Caps? I have encountered these questions innumerable times in my investing journey. Let me share with you three stories which are my experiences. - The Price to Earnings is already below 3. Can it go lower? - The dividend is more than 10% (tax free). Wont investors put money atleast for dividend? I discussed this story with a few friends, but it didn't have many takers. It was a Large Cap which was on downtrend. I gathered all the courage in the world and bought a good solid chunk of REC in June 2016 and holding on tight. My friend, Midcapmantra also recommended REC in this link. Click here. It was September 2016 when another dear friend of mine Rishithegreat (MMB ID) introduced to me a conglomerate company Piramal Enterprises. I was fascinated by the enormous track record of the company and the integrity of the management. Having 3 fantastic solid verticals - Pharma, Financial Services and Data Analytics, the thought process was that enormous value can get unlocked in longer term. The prowess of Ajay Piramal further deepened my conviction and I knew that money invested would not be wasted. It was quoting at around 1800 at that time and the Market Cap was around 30000 Crore. Again a Large Cap!!! I remember the number of times Rishithegreat, Midcapmantra and myself valued the company on phone calls to see if really there was juice in the stock. I took a huge leap of faith in PEL at 1440 and continue to hold it tight. Midcapmantra recommended also in this link. Click here. It was a night of November 2016 when my friend Midcapmantra called me on my phone when I was just leaving my office. It was one of our usual discussions and I realized that he was an expert in Financial Services. Midcapmantra introduced me to the world of Housing Finance. I was fascinated by the Housing Finance business. I had constantly tracked a company called Indiabulls Housing Finance right from 2012 onwards but never took position since I had a feeling that it was always expensive. I never knew how the business works, how NIM or leverage impacts valuations, how its books were etc. That phone call was a game changer. It gave me a solid foundation and a new perspective of the business. I understood that a well run Housing Finance company would grow every quarter. Even a small cut in operational cost could create enormous wealth for shareholders. I learnt about their transparency, the dividend policy and went through their annual reports and presentations. I was enchanted by their growth and their guidance. It was in December 2016 that I decided to own Indiabulls Housing Finance. It was available at a market cap of 27000 Crores. This time I was very very convinced and discussed with friends with most conviction. But the Market Cap was a huge barrier for many friends again. I added IBHFL at 630 levels and holding on so tight now. REC is at 42000 Crore MCAP (165% gain). PEL is at 43000 Crore MCAP (70% gain). IBHFL is at 46000 Crore MCAP (70% gain). 1) Do not close your minds to companies which are Large Cap. 2) Large Cap Growth companies when bought cheap, can create huge wealth with Peaceful state of mind. 3) If a Large Cap company is growing but available at discount due to some macro factors, it can provide enormous downside cap risk viz. Downside will be limited. 4) If dividend is more than 7-8% of the Market Value, have a second and third look and see if the investment is worthy. Sometimes, the downside will be capped due to dividend payout. 5) Have the right friends !!! Listening with open mind to any story always helps. Choosing to own or not is anyway in our hands. We have to listen and give a chance. I wanted to pass on the message that if a company is aggressive and growing, even a Large Cap company can make huge money for all of us. Let us be choosy and compound our money. Here is the link to all my articles. Amazing write-up my friend. Really humbled. Let's keep compounding money in right,safe,sound way...Cheerio. Thanks my friend. Keep guiding and let us compound for a long long time !!! the bottom line is if market provides any correction chances, pick right lage caps, so that sleep properly!!! Dear Anonymous. I only track Intense and I am positive on the company in long term if they are able to manage their expenses and collect their receivables with efficiency. Also, as they grow, customer acquisition will be there. Their product is fantastic no doubt. Will be keen to see how they grow in the next few quarters.. Take your time and invest.. Rest not tracking my friend. Sorry.. Thanks a lot Venu sir..
Dear FI, Nice article. I had bought REC at 161 and Piramal at 1500s as per the recommendation by Chilax (mmb) and still holding..
Dear JA!SE bhai.. So nice to see your response on this.. Chilax is a great boarder on MMB. You should read about him in MMB Profile section :P :P :P.. You will love it my dear friend.. Have a look.. Dont miss..
Sure Ashish bhai. Ill keep updating as and when I get time :-) I try to write one solid article every month. Good one. Interesting to read n Ponder. Willkeep in mind going forward..